Note: Duplicate of NORTH WEST, 1894; 3 stacks; 2 watertight bulkheads; double-bottom baliast; electric lights. 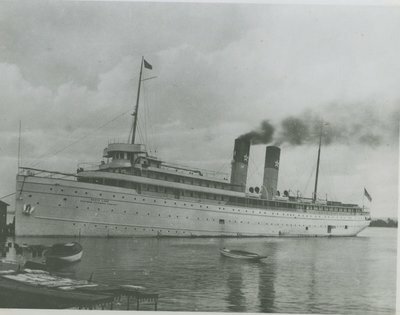 Northern Steamship Co., Superior, WI. Two 25.5, 36, 51.5 & 74" X 42", 7000 hp @ 120 rpm engines built by Globe Iron Works, Cleveland, OH. 7'9" X 6' 4.5", 265# steam, Belleville boilers by Globe Iron Works, Cleveland. Scrapped by Sorel Mechanical Shops, Ltd.
1895, Jan 5 Launched; ran weekly Buffalo, NY - Duluth, MN. 1895, May 25 Collision with schooner MAGNETIC at Cleveland, Lake Erie. 1896, Sep 21 Sank at Duluth dock due to seacock left open. 1901 Ran Buffalo - Chicago, IL during Buffalo Exposition. 1901 - 02, Winter Rebuilt; 5 decks, 2 stacks; ten 12.6' X 11.6' scotch boilers; 8600 hp. 1911, Jun 3 Some fire damage when NORTH WEST burned. 1911, Aug 25 Coal bunker caught fire; slight damage. 1918, Dec 25 Owned Davie Shipbuilding & repair, Ltd, Lauzon, QUE. 1919 Cut in half & taken to Montreal to be rejoined & used in World War I; never done.